I bought two polishes from the new Autumn/Fall Essie collection. Sew Psyched and Merino Cool. Merino Cool was a bit of a no-brainer for my dusty mauve/grey loving fingers… but Sew Psyched took a little leap of faith. I was hoping that the grey tones in this would soften the green to something special. A two coater with a sprinkling of silver shimmer. The shimmer is barely noticeable… but does lift the colour a little in direct sunlight. I personally don’t think it benefits much from it’s inclusion and quite like my dusty colours to look flat anyway. No problems with application and normal wear time make this a hit for me. Absolutely beautiful! I love greens like this. 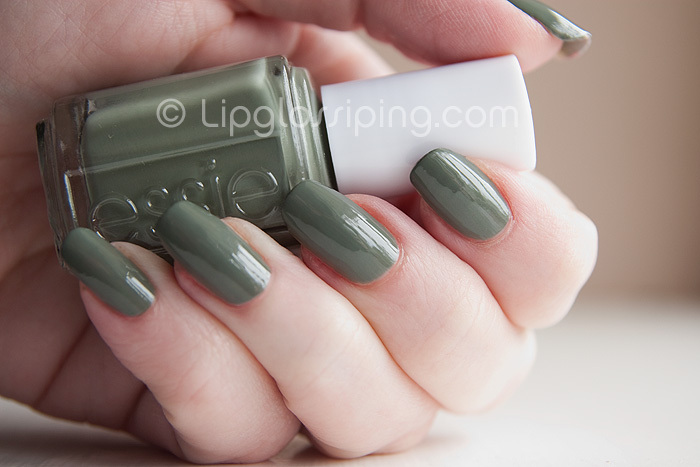 Unfortunately as Essie is an animal testing line I’m going to have to hunt down a dupe because it is lovely. Thanks for the post! Didn’t know Essie tested on animals. Well that’s the end of my love affair with the line. Sad. Lovely Charlotte – would you do a post at some point featuring all the brands (or major ones) that do test on animals, and those that don’t? I know there’s been some confusion over L’Oreal – I think they test ingredients on animals but not the finished products? – but I have no idea where to go to get this kind of information, and would love to know. Love it, just bloody love it! Ooh, this looks so nice. I didn’t realize it had a tiny bit of shimmer in it. Now I must have it! Wow! Wow! This is a color I would never have thought of getting but you might make me change my mind! Yukky greens are an obsession of mine. So why don’t I have any? Conundrum. This is fab. Sorry folks but I just don’t get all the sludgey colours that are around at the moment. It’s an awful colour. Before you denounce me for trolling let me add that I enjoy reading this site and love the Beehive lipstick that I bought because of an earlier post. Oh, PRETTY! I love nail polish, but somehow greens aren’t usually my thing. This one looks very beautiful, though – too bad I can’t spend any more money on polish this month or I’ll starve. Which would be bad. Right? Right. I don’t really get this colour! I saw lovely new nail polishes by isa dora today! very pretty on you c! i la la love this shade, so happy essie did a RBL dupe! I don’t think I would wear something like that, but I like it on you! How do you get your nails to stay so long and strong? They look amazing! I love green nail polishes and this one is gorgeous! Recommend me some great greens!